Twice a year I do a really good, deep coop cleaning. 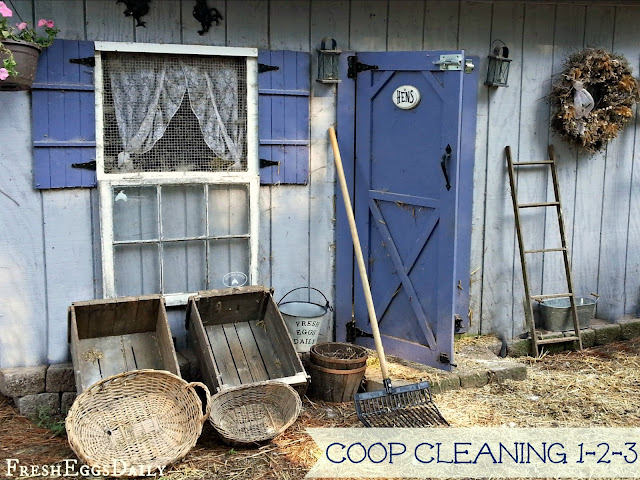 I scrub down the whole coop with a white vinegar/water solution once right before the weather turns cold and then again in the spring. 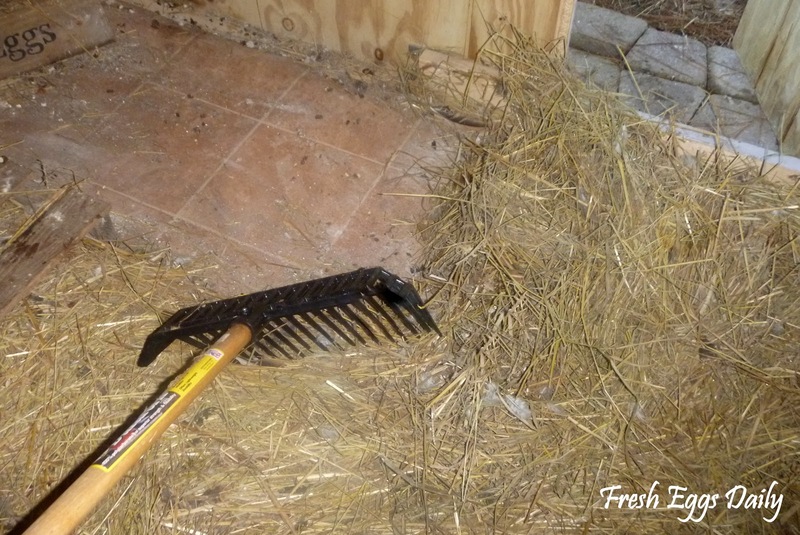 Fresh, new straw bedding goes down and I also toss in some fresh or dried herbs for added health benefits and aromatherapy. In between the deep cleanings, I do quick interim cleanings as needed. Coop cleaning doesn't happen on any real schedule, instead I use my eyes and nose to let me know when it's time -even a hint of any whiff of ammonia smell and it's definitely time. Otherwise when the straw starts looking dirty, it's time. Although extremely messy bedding does get removed each morning and the nesting boxes are refreshed as necessary, after awhile the straw doesn't look fresh anymore and I know its time for a full coop cleaning. I clean my coop the natural way. 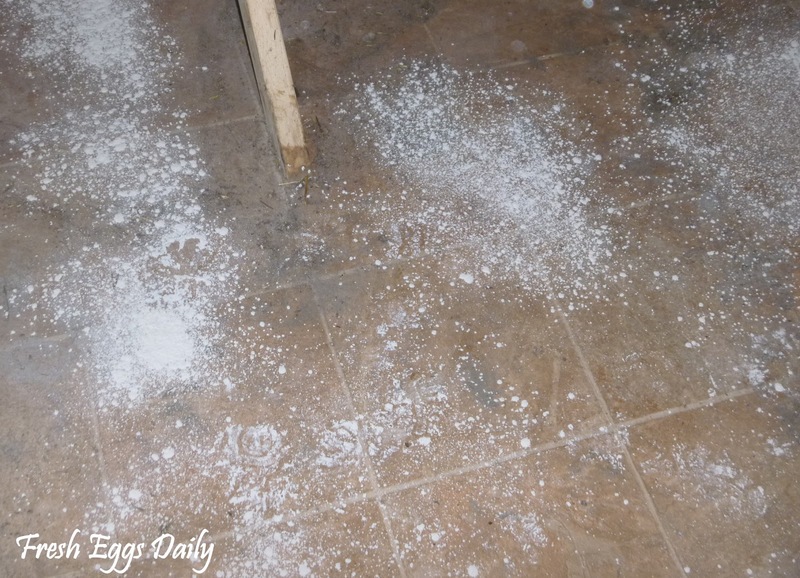 You wouldn't spray chemicals in your baby's crib to clean it, would you? Of course not. 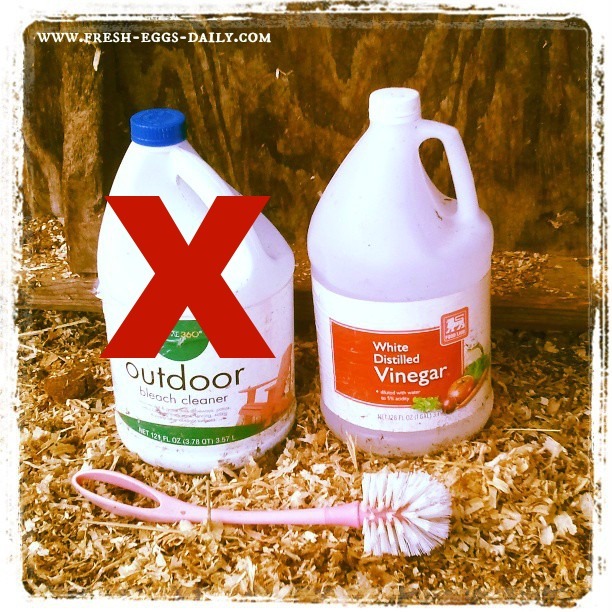 Nor do you want to use chemicals when you clean your chicken coop, no matter how dirty it gets. Products such as Sevin Dust, household bleach, aerosols sprays, creosote and other potentially hazardous products have no place in or around your chickens, who are extremely susceptible to respiratory illness. 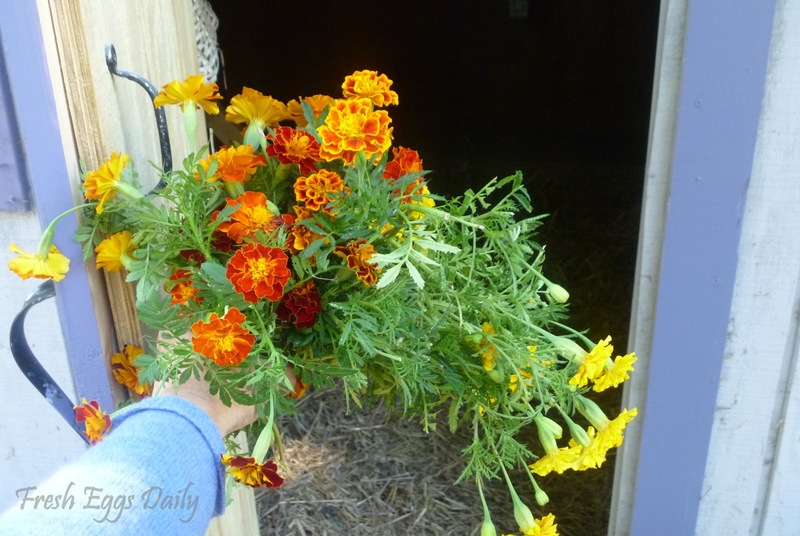 Fortunately, there are plenty of natural products you can use to keep your coop clean, smelling fresh and free of mites and other parasites. 1. Rake out all the old bedding (I use straw) and spread it in the sun to air out. Sometimes if most of the straw isn't dirty, I'll reuse it since really only the straw under the roosts tends to get pooped on. Did you know that UV rays (sunlight) are the BEST way to kill pathogens, mold and bacteria? After a day of sitting out in the hot sun, the straw is dry and can be put right back into the coop. 2. While you're at it, sweep out the cobwebs. 3. 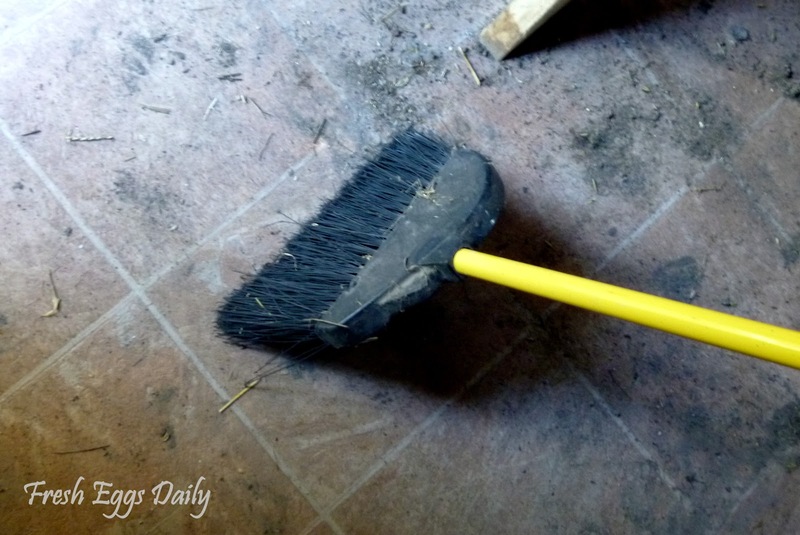 Then sweep out the dirt. (Since this is just a interim cleaning, I don't scrub down the whole floor with the white vinegar/water mixture I would use for a deep clean, I just get it 'broom clean'). 4. 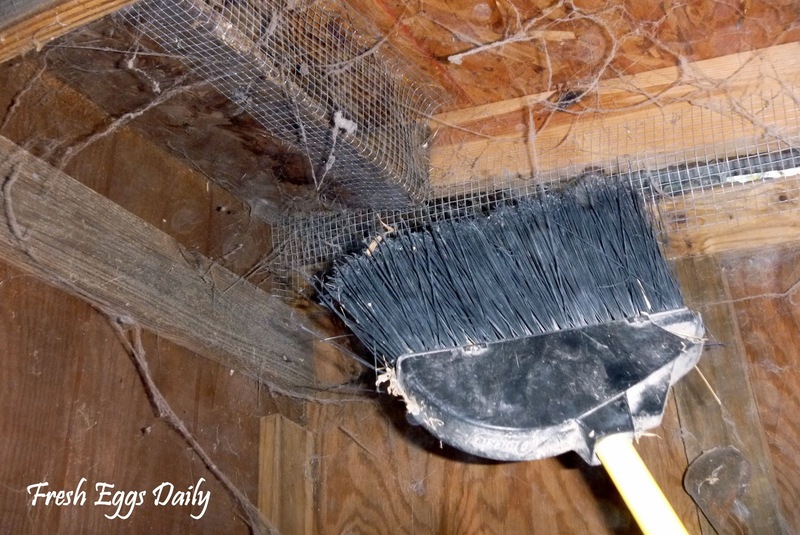 I use a plastic paint scraper and bucket to scrape any poop off the roosts, nesting box area or other flat surfaces. Take this opportunity to run your hands along the roosts to check for splinters or mites (black spots or blood smears indicate the presence of mites so an extra sprinkle of DE is in order). It's an all natural cleaner/insect repellent. The orange peel, cinnamon and vanilla all work as a natural insecticides, so spray liberally. 1. Generously sprinkle food-grade Diatomaceous Earth on the floor and in the nesting boxes. [Click here for the benefits of DE...] and sprinkle some coop deodorizer if you wish. Wear a mask to avoid breathing the airborne dust and take care to keep the chickens out while you are sprinkling the DE because the dust can be a lung irritant. 2. Replace the straw bedding on the floor either with the aired-out straw or new straw so you have about a 6" layer. 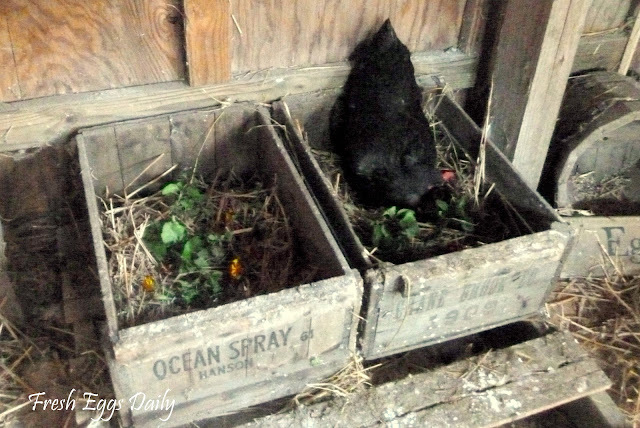 Replace the straw in the nesting boxes. 5. Let the girls in for the night - and listen to their contented coos over a nice, clean, scented coop. And just maybe, they'll each lay you a beautiful egg the next morning! Nice & clean! Your coop is precious, btw! Oh thank you! I love pretty things! And a clean coop is awesome - smells so good! I just hate the cleaning part. My young girls like to roost over their nest boxes causing a lot of mess in them. They are not laying yet. They have plenty of roost bars (3). Any thoughts on getting them to roost on their roosting bars instead of on their nest boxes? The top of your nesting box should be slanted to prevent that. You can just attach a board at a slant to keep them off the tops. I too have wood over the nest boxes which over time got a bit ugly and smelly. I cleaned and scraped everything, sprinkled down some lime on top of the wood and then laid cardboard on top. A terrific fix, no smell and I can clean so much easier. 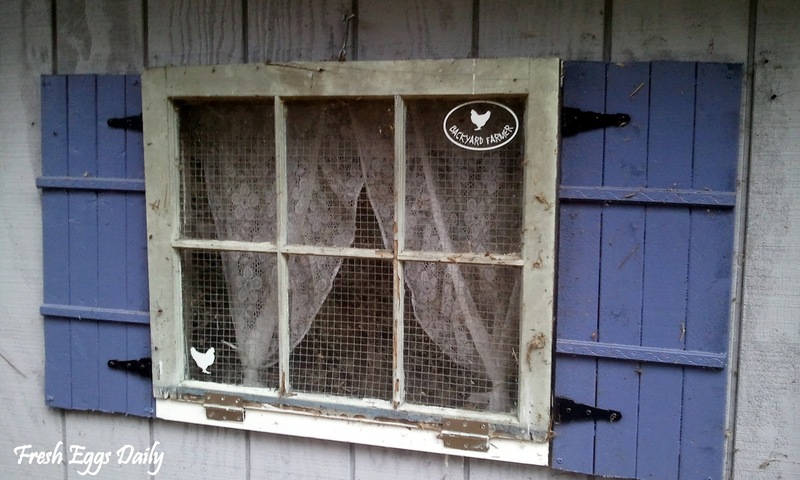 Oh your coop is so sweet, I just love the added touch of the curtain! SO cute! Oh how exciting! Same here, I grew up across the street from my grandparent's chicken farm and we raised chickens growing up, but its alot different when you're the adult in charge of them! I am excited for my book - its written for the beginner but with tons of natural chicken keeping tips. Honest are top notch. I've tried the other expensive brands and a few of the house brands and I keep going back (on my 3rd baby now). They fit great, they don't leak and they don't have obnoxious prints on them! Amazon can have some really great deals on them too! Watch for them and stock up! Lovely post. love the little playhouse for chickens so cute. Love the natural remedy too. I've never seen such fancy chicken houses. Ours is a long two room shed with roosts on one end of a big room and nests on the other end, feed and water troughs in between. It has a dirt floor and would never dream of putting curtains up in a chicken house. The other room is a small brooding room for hatching eggs under the mother and a habitat for safety the first two to three weeks of their life and then they're moved to the "big house". I have to clean out the shed at least once a month and put down lime for the lice. I feed them vinegar water twice a month but they still seem to get wormy from the free grazing I'm sure. 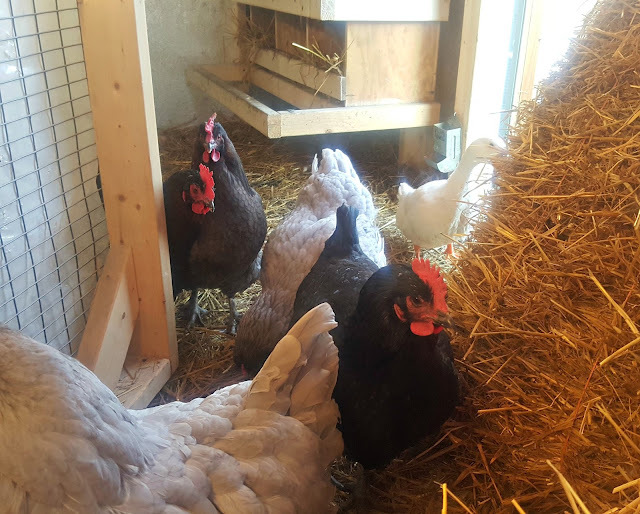 I've got four young ones (one hen and three roosters) that love the roost but sometimes head for the nesting boxes to keep the pecking order from getting out of hand. 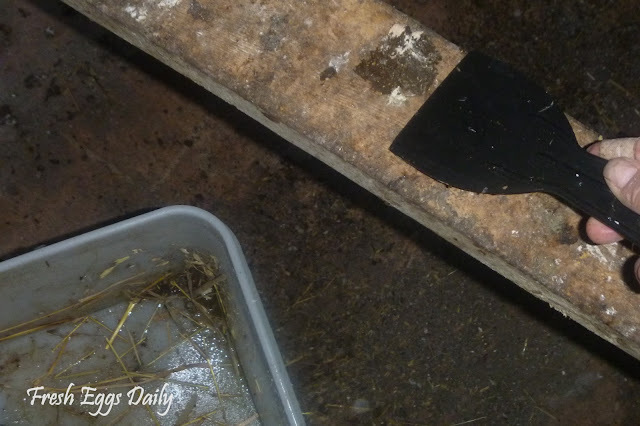 This means cleaning the nesting boxes a couple times a week. Thank goodness they don't use more than two to sleep in but will soon break them of that habit. Well what can I say? I like pretty things! My one worry with a dirt floor is that things like coccidia can take root especially if you leave feed and water in the coop, and predators can easily dig underneath and get in. Block the nesting boxes at night to break them of that habit, the young ones learn quickly to go to roost earlier than the others so they don't get pecked. Terrific info, we're looking forward to your book! Our coop arrives soon, so hopefully next spring we'll have a few hens of our own. Just an FYI, if you get an unsubscribe notice, don't worry, I am not going anywhere, just moved my favorite blogs over to BlogLovin! It's so wonderful how generous you are with information! This is so helpful - from the herb sprinkling to all the recipes. So grateful. Love, love, love adding herbs to the bedding. And thanks for posting the recipes. I'm grew up with chickens, but was never in charge of raising them. Now, I'm converting my parent's old farm chicken coop into a bastion of wholistic chicken-raising goodness, one small step at a time (as I learn). 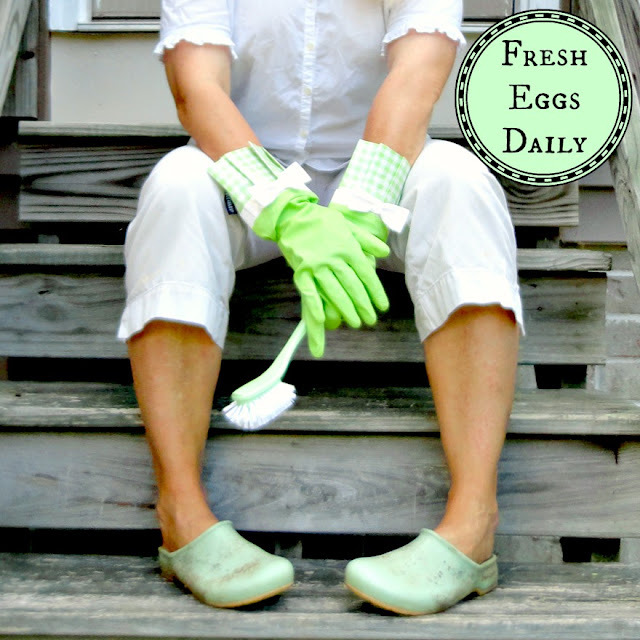 It's time for the spring cleaning, and I'm very happy to have found your site before I dove in!